The MPL4082 is the industry's most integrated, all CMOS 68EC020 32-bit single board computer, and has an impressive list of features: six 32-pin sockets organized in two banks for SRAM and EPROM allow up to 3 Mbytes of internal memory, on-board battery for buffering of SRAM and RTC, serial and parallel I/O's, Real Time Clock with calendar, Watchdog, Power fail detection and serial EEPROM. With an optional floating-point coprocessor 68882, computing and calculation power can be upgraded by factors. The MPL4082 can be further customized with the use of a miniature 30-pin connector for additional mounting of SIMM Modules (small PCBs). 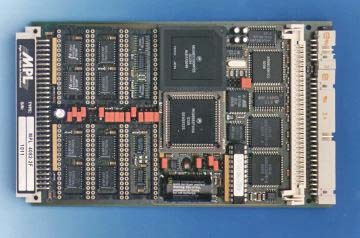 The board also supports a full 16-bit G-64/96 bus interface for I/O extension and up to 12 Mbytes of external memory. The fully CMOS architecture and its single-supply design draws a mere 300mA on 5V only and makes the MPL4082 ideal for a wide range of control, data acquisition, and portable microcomputer applications.